This structural defect occurs when malleable cast iron does not solidify completely in white as a result of an incorrect composition (carbon-silicon and manganese-sulfur ratio) and when traces of aluminum, lead and arsenic are contained in the iron. 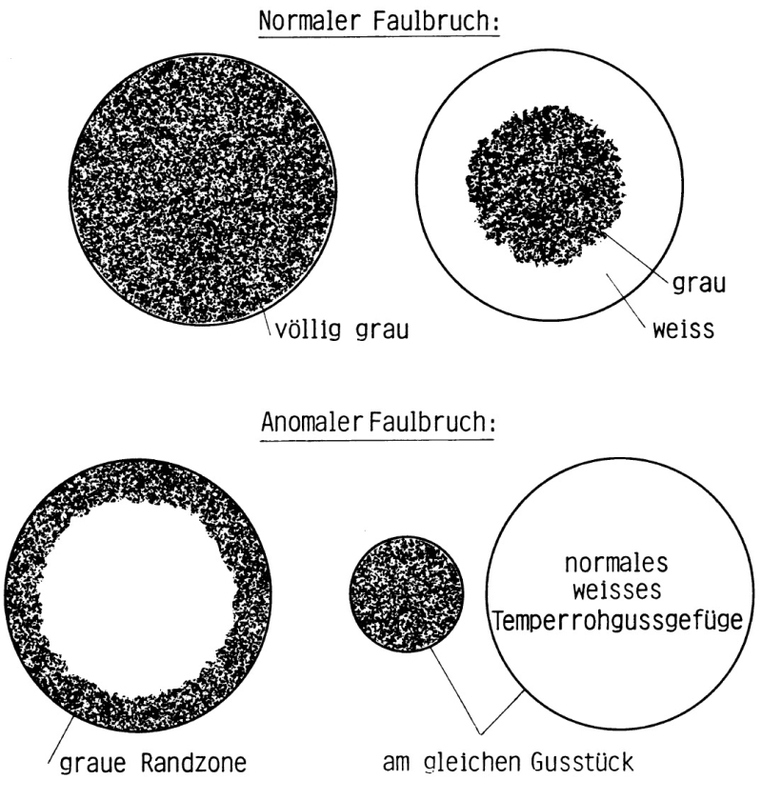 Generally, nest-like inclusions of flake graphite can then be seen in the fracture surfaces. Graphite produced by this effect cannot be modified by subsequent tempering. This effect is promoted by highly oxidizing melting conditions, the uncontrolled addition of ferro-silicon and delayed cooling (high wall thicknesses). Therefore, the carbon and silicon contents, in particular, should always be adjusted to the cooling rate which is determined by the relevant wall thickness ratios. Normal mottling either has a white fracture cross section including a gray core or is completely gray. In contrast to this, when referring to abnormal mottling, the corestructure appears white with a partially gray edge zone (Fig. 1). When thick cross sections solidify completely in white, while thinner sections show gray solidification, this is also called abnormal mottling.